You may have heard a little buzz about the upcoming Disney*Pixar movie The Good Dinosaur. Actually, you may have heard a lot of buzz about it. Well, the countdown is on until The Good Dinosaur hits theaters on November 25th (that’s Thanksgiving Day). Less than one month to go and I am super excited about it to say the least. 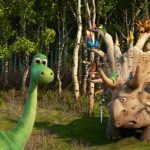 Today, I have more Good Dinosaur Coloring And Activity Sheets to share with you. I even have a fun pumpkin stencil you can use for Halloween too! Hopefully, these will keep your little ones occupied until we all get to experience this wonderful movie soon. To download the coloring sheets, simply click on the picture below. Just in case you missed it, here is a peak at the official movie trailer.